My ranch hostess, Judy, will accompany me today when I drive Floribunda to Sacramento to learn "Hitching the Smart Car and Driving an RV, Towing." I'm a little nervous but know it's a matter of getting in there, paying attention to instructions, and being careful to maintain my calm. If my little twinge of nerves be known, it's not to say that I'm not really excited too, because I am! This is just another opportunity to learn something new - that will make more opportunities available. Hooray! We're going to leave here in time for me to have my lesson and practice drive with the Allied Trailer man - and get back here to the ranch, hopefully before having to deal with commute traffic on I-80 East. I'll try to check in later today with an update. 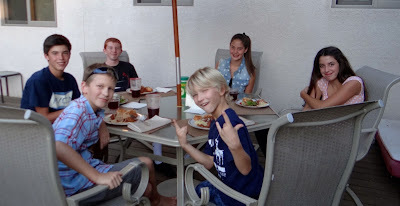 Here's a photo of Justin (giving high sign) and, around the table, Joshua, Spencer, Blake, Tate and Avery - at the spaghetti feed last Saturday evening. 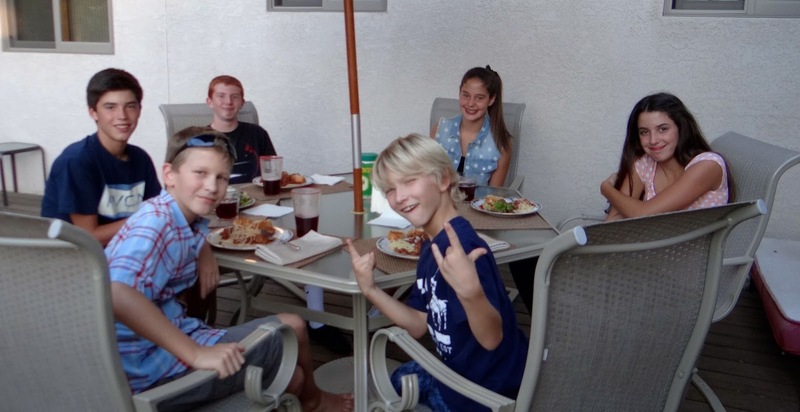 Spencer, Tate and Avery are my 13-year old triplet grandchildren; Joshua and Justin are Judy's grandkids; Blake is Spencer's friend. G'day MP -- I think a lot of us can relate to that nervous churning in your gut. There are times when October seems kind of late in the game for new lessons and great adventures. But you've had your share of those already--the times when you weren't sure you could, then found out you could. And you know how good it feels to know that you stared down those demons. That's what I enjoy about telling my stories, about the ones who take their chances and live with the outcomes. It sounds like you've got a lot of folks to lean on in the shaky times. So just go out and do it. Gook luck. Thanks Gil. I'm just sitting here relaxing after an almost non-eventful first towing session. I thought I'd be nervous, but felt pretty comfortable all in all. Now it's just get all the little niggly things done and we'll be off. I'm starting to read about possible camping sites in Oregon. There're lots to choose from! You're going to do just fine! My husband has a little check list he keeps in the glove box of our toad. He can remember all the steps but he's VERY SURE that I cannot so I always know there's a cheat-sheet there for me. Take notes and don't be shy about it. I've made up some checklists too. This afternoon, after the trailer guy gave me all the instructions, I wrote the hook-up process step by step; then when I got back to the ranch I just followed the steps - backwards - for unhooking. Everything about the process made sense to me so I'm finding it easier to remember. I do plan to follow Contessa's advice: Don't talk and hook-up at the same time; concentrate! Yup, a Smart Car, made in Germany and imported by Mercedes Benz. It's so cute and it just zips right along. Now I'm not hindered by not having wheels to be able to explore while the RV is set up in a camp-site. Lacy and I will hop in the Smart Car (Petunia) and visit all the interesting towns and people all over this wonderful land. For other readers, this is Addison, my wonderful granddaughter who has just relocated to colorado Springs where she'll "Teach For America." I'll have lots of things to share about her experiences too! Yes, I am totally loving retirement and all the adventures associated with it. This upcoming adventure is planned for at least a year - maybe more. Love hearing from you. Hope everything goes well for you Mary-Pat. I know for sure I would be nervous just to drive the motorhome. I driven Sherman once and that was only a short distance on a road that nobody drives on. I am much happier just to be a passenger. You already have half the battle won as you are at least used to driving a motorhome. Sorry I haven't been reading lately, we have just been too busy at the campground, things will slow down soon and then I can get back to blogs again. Don't I know you and Kevin have been busy? You are great managers - and it sounds like a really difficult job. I am so looking forward to following your adventure in Namibia and hope to see you again - maybe when you get back. I may be heading down to Mexico about the same time; so we must stay in touch. Are all the plans made for getting to NYC for the flight?